There’s no doubt about it; John Scalzi writes entertaining books. 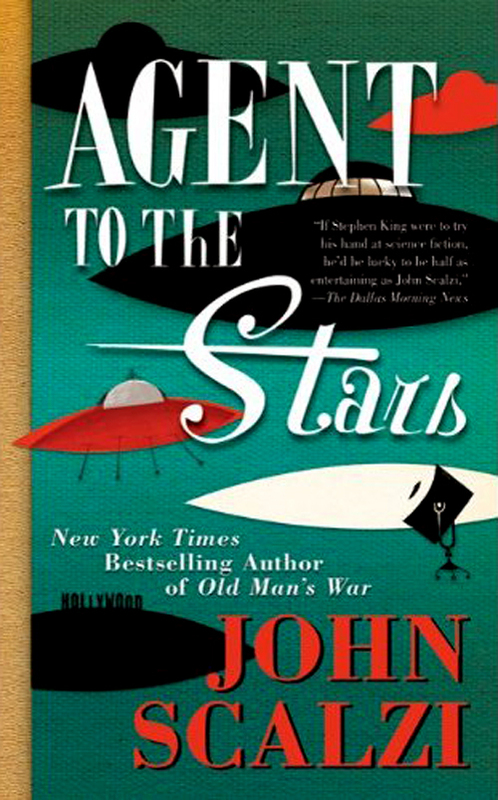 Agent to the Stars is a hilariously reimagined first contact story, complete with aliens that communicate with smells—opening the floodgates on stink jokes wide—and Hollywood life in all of its ridiculousness. Scalzi’s imagination really has run wild here, and the result is fantastic. The Yherajk, who can shift shapes into inhabiting or imitating human bodies, as well as those of animals, are interesting. They bear a strong resemblance to Sanderson’s Kandra—or perhaps I should say the Kandra bear a resemblance to them. Agent to the Stars was originally published online in 1999, and Sanderson’s Mistborn trilogy didn’t come out until 2006. Despite this, however, neither species feels redundant, as the authors have given them entirely different personality characteristics and goals. The aliens have an interesting story of their own, and they have good, believable reasons for wanting to stay hidden until the human race is really ready for first contact, which I appreciated. It’s nice to see that Scalzi applied a decently high level of rigor to all parts of his worldbuilding, especially the important ones that drive the story in the background. And like any good science fiction author, he doesn’t shy away from the moral implications of the creatures he’s created. He examines the a human’s right to his or her own body and mind, and when it’s really right to take over someone’s mind—and for what reasons. The discussions, which happen in the later sections of the book, are fascinating and important, as we move closer and closer to having the ability to do this ourselves—albeit in technological, not biological, ways. It’s not all heavy discussion, though. Other parts of the story are built almost completely for the humor factor. The alien’s smell based communication systems, for example, or some of the relations our main character, an up and coming Hollywood agent, has with his colleagues and clients. Still, since Scalzi, for the most part, manages to keep these to hilarious asides, they don’t distract from the main plot, and there is a sense of drive that permeates the novel. Here, as in The Android’s Dream, Scalzi has managed to balance the two—plot and humor—better than most other authors I’ve read. While the pacing is good, and the story drives the book, I feel that the ending was rushed. We only get to see the last six months or so of plot points, after what I guess Scalzi felt was the last “important” plot event, before we get the concluding scene of the novel. This odd montage felt out of place with the rest of the novel, and really detracted from the experience for me. It’s fine when you have a training montage partway through your novel—that makes sense. But to have one right before the end, it felt like Scalzi just wanted to jump ahead and grab the emotional payoff of the last scene before wrapping up and saying he was done. Thankfully, though, the montage didn’t detract from the final scene, at least for me. It’s a powerful, emotional, and important thought-provoking scene. I won’t spoil it, but given that the novel is a first contact story, you can probably make some educated guesses as to what happens. By the time you reach the ending, there are no twists, no crazy pull-the-rug-out-from-under-you moments to make your head spin. It nevertheless accomplishes exactly what it should, and it mostly redeemed the previous montage for me. In summary, Agent to the Stars by John Scalzi was a delightful and humorous first contact story, mixed with a few deep philosophical and moral questions that do not detract from the entertaining and engaging plot, which I felt only faltered in the rushed ending. I would recommend it to anyone who enjoys a fun read with aliens, and happily give it four of five stars.